Friday night’s action saw plenty of goals as Quilmes and Atletico Rafaela played out an entertaining 3 – 3 draw with all the goals coming in the second half after a drab first period. In the later game in Rosario, Newell’s Old Boys hosted Belgrano and ran out comfortable two goal winners. Ignacio Scocco, last season’s top scorer, opened the scoring and he looks like a good bet to up there as the league’s golden boot once again. The game was not without incident as the ugly side of Argentinian football reared it’s ugly head. Crowd trouble late on caused the riot police to move in and “police” the Belgrano fans, as the Belgrano players went over to attempt and calm the situation, centre half, Gaston Turus was hit in the face by a policeman. Ridiculous scenes and unfortunately all too common in Argentina. GOALS AND THE INCIDENT HERE…. After a first half lacking quality and action the second half that these two sides offered more than made up for it. Just two minutes into the second half, Rafaela took the lead, Juan Eluchans tapping in from close range. Despite, Quilmes controlling the game and creating more chances it was Rafaela who took a two goal lead, German Rodriguez with a great finish from outside the box. A minute later, Quilmes got a lifeline when striker, Cristian Menendez with a looping header restored hope but it was Rafaela that got the next goal when a corner caused panic in the Quilmes penalty area and defender, Eduardo Dominguez pounced. They couldn’t hold this lead for long, once again, a minute later Quilmes scored, this time through Martin Cauteruccio. With minutes left, Quilmes got level when a fiercely hit cross was put into his own net by Fabricio Fontanini. Unfortunately the major talking point from this game will be the crowd trouble and the resulting injury to Gaston Turus but on the pitch it was a good victory for Newell’s. 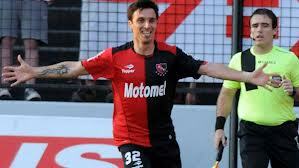 Ignacio Scocco headed Newell’s in front continuing on his fine goal scoring record from last season. The second half saw the incident for which this game will be remembered (you can see the incident below) and although Newell’s had dominated the game it was in the resulting lengthy stoppage time that the game was wrapped up, Maxi Urritti breaking to make it 2. Here is the crowd trouble – the player who gets hit is number 25.